Voir notre vidéo YouTube a récemment téléchargé appelé: Le SandBarr - Roatan - cette vidéo vous guide à travers la villa et les beaux jardins Meridian. Le SandBarr est un deuxième étage trois chambres à coucher privée, trois salles de bain, moderne avec un luxe de deux étages face à l'océan condo avec 3600 pieds carrés d'espace de vie (2000 sur le niveau principal et 1600 pieds carrés niveau supérieur avec salle familiale, mosaïque patio carreaux de travertin et privé piscine sur le toit) où vous pourrez profiter du son de l'océan, des couchers de soleil, incroyables vues du ciel nocturne, et la tranquillité de la plage privée près immédiatement l'avant de la villa. Parfait pour une escapade romantique ou amener la famille pour ce voyage mémorable. Nous ne louons une voiture - nous préférons marcher dans West Bay Beach, mais vous pouvez constater que vous préférez louer une voiture - cette décision est totalement à vous. Le Barr Sable est situé au Méridien, un des développements les plus exclusifs de Roatan. Il est situé sur la plus occidentale pointe de l'île, surplombant les eaux turquoises des Caraïbes. Le sont cinq bâtiments qui contiennent 19 villas de luxe donnant sur 680 pieds de rivage privé qui inclut des plages de sable blanc, la «terre de fer» et bassins de marée. Le Meridian possède un style européen du vieux monde avec une ambiance méditerranéenne. Les motifs sont paysagers luxuriants avec un restaurant récemment ouvert. Une piscine à débordement est situé le long de la plage où vous pourrez profiter du soleil. Une plus grande piscine tropicale avec un bar swim-up est incroyable pour se détendre pendant la journée. Bâtiment est en béton avec toit de tuiles et de fenêtres à triple vitrage, de conception allemande. L'intérieur est fini avec le meilleur dans les armoires granit, pierre, et de feuillus. Très efficace climatisation centrale maintient l'aise sur la plus chaude de jours et vous permet de dormir confortablement. Situé à la pointe de l'île, vous êtes dans un endroit sûr, loin de la foule et le bruit des bars que vous rencontrez sur la plage de West Bay, en particulier lorsque les navires de croisière sont au port. Kismet est un nouveau restaurant sur place qui a ouvert en 2014. Détendez-vous sur la plage privée près, nager ou faire du snorkeling en face de la villa. Monde de Beach célèbre West Bay est à moins de 10 minutes à pied ... connaissent les eaux calmes, chaudes et le sucre de sable blanc! Dans la matinée, vous pourrez siroter votre café et regarder les bateaux de croisière passent, peut-être vous aurez même voir des dauphins nagent passé le point. Une grande partie de Roatan est entouré par un parc marin, certains des meilleurs snorkeling ou plongée sous-marine dans le monde vous attend. Laveuse / sécheuse est pas disponible, peut être négocié pour les séjours de longue durée. Si le linge est un must alors il ya une charge de 9 $ de plus par charge - lavé et plié par le personnel très serviable au méridien. Wow, just WOW!! Roatan Perfection! The owners of The SandBarr, Arlene and Gordon Barr, go beyond hosting guests at their luxury ocean front villa. They really want to make sure your holiday in their home is an amazing one. Communication before booking is instant, and both are happy to answer any questions one might have before confirming, and into the visit itself. They have an AWESOME, "Notebook to The SandBarr" for guests, which is beyond incredible, as it recommends potential drivers, car rental companies, activities, restaurants, points of interest etc. Most places they recommend from experience, which really helps. They include explanations, pictures and maps of where to find local restaurant attractions. Their honest and candid write up, was referred to appreciatively, during our entire stay. The Villa hosted 3 couples extremely comfortably, with high end furniture, decor, appliances and lovely linens/bedding (Think Pottery Barn). I slept like a baby in the master suite king bed. Coffee maker, dishwasher, ice cube trays, you name it. They really left no stone unturned. The pictures online are true to form. It is a beautiful home. Each bedroom has its own ensuite, and balcony (the master over looks the ocean, and the other two overlook the beautiful pool area). The upstairs plunge pool area has a complete dining set for 6, plus three lounge chairs and bar stools/high table. An amazing place to enjoy the sunset, which we did every day we could. The villa has many games in the console under the television set in the living room. Although the leather furniture was decadent and inviting, we admittedly spent most of our evenings around the huge, round table playing cards and other board games. It was SO much fun! The Meridian Lighthouse Estate itself, is stunning. Lounge chairs surrounding the ample pools, towel service poolside, AND plenty of pool floaties for kids and adults alike. Hummingbirds are everywhere, attracted to the beautiful flowers on the grounds. The staff is very friendly and accommodating. Kismet, the restaurant on site, is wonderful. We enjoyed afternoon drinks, and delicious lunches/dinners there often. 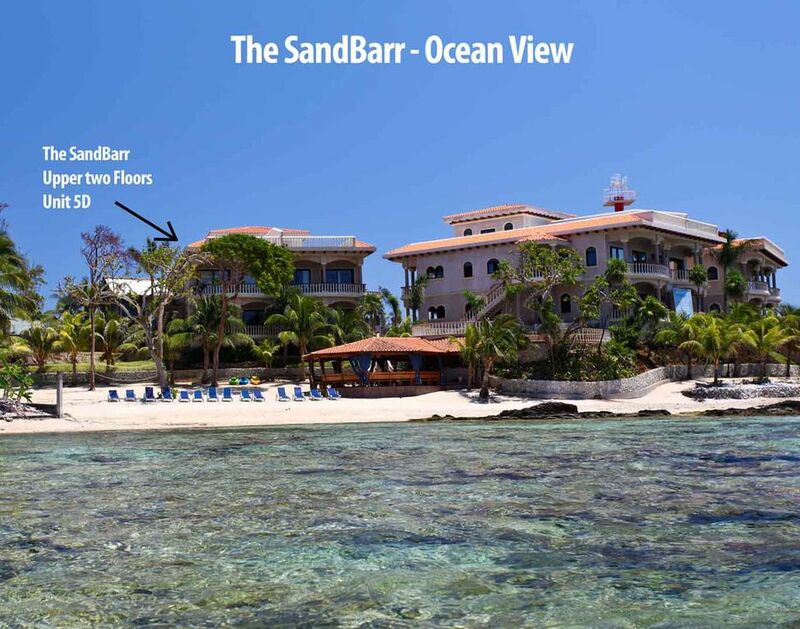 The location of the The Sand Barr, in our opinion, is PERFECT while staying in Roatan. It's vicinity to West Bay Beach and West End Beach is incredible. Lively bars/restaurants/beach during the day/night, peace and quiet at the villa after that. If you visit Roatan, you will be doing yourself a favour if rent this villa! We HIGHLY recommend it!!! We just got back from a vacation here. My wife and I went with two other couples. It was spectacular. The rooftop patio is great. The snorkelling off the beach is some of the best I have seen anywhere. The condo is spacious, modern, clean and comfortable. The staff at the resort were terrific. This is a nice quiet spot that is a five minute walk to an area with lots of action. It really is the best of all worlds. Thank you for taking the time to submit a review of The SandBarr Roatan. We also think our location is the best of both worlds. We love how quiet the beach that we over-look and it is a nice 5 minute walk to restaurants and bars if you are looking for some night life. We enjoy the snorkelling too - there is so much to see! We hope you consider staying at The SandBarr on a return visit to Roatan. We loved staying at the SandBarr. From day one the staff were helpful,friendly and accommodating. Having traveled thru out the Caribbean and Belize ,we loved Roatan the best. The villa was perfect for 3 couples so much room and very well equipped. Beds very comfy, bathrooms modern and clean. The views especially at sunset were spectacular. The food at the Kismet Restaurant was delicious , actually it was one of our favorite restaurants- Alex took very good care of us . The diving and snorkeling are the best, still healthy reefs and lots of colorful fish. Would highly recommend the SandBarr and the incredible Roatan. We are so glad you enjoyed your visit to Roatan and our lovely villa The SandBarr. We too like the Kismet and you really can not beat the location of the restaurant to our villa. Alex is a wonderful chef and we too have enjoyed his cooking. We look forward to hosting you on any future trips to Roatan. We are a family of 4 adults that spent 6 wonderful days of our 11 day trip to Roatan at the SandBarr villa. From the moment we arrived, we were greeted by the friendly and attentive Meridian staff. The villa is stunning with 3 comfortable and spacious bedrooms with beautiful views of the sea and pool. The beds were so comfortable and the villa was well stocked with everything we needed for a relaxing vacation. The location of the villa cannot be beat! You are a 5 minute walk from beautiful West Bay beach yet have your own private beach, rooftop plunge pool and restaurant when you want to get away from it all. We ate many meals at the onsite restaurant Kismet and enjoyed their delicious food and laid back atmosphere. Arlene and Gordon were amazing hosts from start to finish. They provided us with all of the information we needed to plan unique excursions and make dinner reservations. They even recommended Juan Carlos Rodriguez as a tour guide who made our trip most memorable with day excursions to Little French Key, Havana Beach, Anthony's Key and ending with an entire island tour all the way to Camp Bay Beach (a must!). If you stay in Roatan you MUST book with Juan Carlos Rodriguez. We are already planning a trip back for next year. We are seasoned travelers and our trip to Roatan was by far our favorite thanks to Arlene and Gordon! We can't wait to go back. Many thanks for sharing your little slice of paradise with our family. We are so glad you enjoyed your stay at The SandBarr and are planning a return visit. Juan Carlos is a great guy and a seasoned guide of the island - we highly recommend him as well. We hope you book your future trips at The SandBarr Roatan. This was our 2nd time staying at the Beautiful SandBarr and once again it did not diissapoint. We were excited to show our children & grandchildren all that it had to offer, and they fell in love with it just like we did. as well as in the kitchen, dining room & living room. Arlene & Gord have thought of everything to make this home feel like your home. We spent time on the Little Beach in front of the Villa in the mornings, then would either spend the afternoons at West Bay Beach or in the Beautiful Pool at the back of the Villa. Our granddaughter (age 12) and grandson (age 10) loved floating up to the swim up Bar and ordering a mocktail (with an umbrella) and spending the day in all of the different levels of this gorgeous pool surrounded by Palm Trees & Flowers. We’d watch sunsets from the Roof Top Plunge Pool, and then later relax on the deck off the Living Room until late evening. I would recommend that anyone who snorkels do the Snorkel & Swim Activity with the Dolphins at Anthoney’s Key. Another fun thing they enjoyed was Daniel Johnson’s Monkey & Sloth Farm. On Sunday nights at Banarama in West Bay they have Crab Races and Fire Dancers on the Beach starting at 6:30. There are so many cool places to eat in West End, but we also had a Private Chef (Chef Blackie) come cook for us one night at the Villa. There is information about this in the Book on the table with many other helpful tips of things to do on Roatan. We have only been away from the SandBarr for 3 days and already we are counting days until we can go back again. Thanks Barr Family! Thank you so much for taking the time to submit a review of The SandBarr Roatan. We were delighted that you booked a second visit to our lovely villa and are glad that you enjoyed your stay. We hope to have you stay with us again on future visits to Roatan. The Sand Barr is a must stay vacation. Everything you need for a comfy luxury stay on one of the best snorkeling beaches in the world. Arelene and Gordon (owners) have all the details covered and will make sure you are completely taken care of. If you're on the fence, just book it, you won't be disappointed!! Thanks for taking the time to write a review - it is very much appreciated. We are glad that you enjoyed your vacation at The SandBarr and that you recommend it to others. We hope to host you and your family on your next Roatan vacation. Moins de dix minutes à pied et vous serez sur la plage de West Bay, l'un des meilleurs dans les Caraïbes. Louer un parasol et chaise longue ou configurer votre serviette et vous détendre dans le sable de sucre blanc. Restaurants et bars bordent la plage, et un happy hour est disponible dans la plupart des lieux! Vous pouvez louer paddleboards, jet skis, parachute ascensionnel, jouer sur la structure énorme toboggan / de jeu gonflable, aller à la pêche, ou prendre un taxi d'eau à West End. Rental rate based on 6 person rental. There is a $30 per person rental fee for groups over 6. Complete rental agreement provided upon booking. All Guests must be registered to stay in the Villa. Until confirmed, rates are subject to change without notice. LAST MINUTE BOOKING? DISCOUNTS GIVEN FOR LAST MINUTE BOOKINGS. As long as our calendar is open we can try to accommodate. More than 6 guest there is a $30 per night charge to a maximum of 8 guests to stay in The SandBarr, extra guests have to be approved before rental period and discussed at the time of booking.